Brian DeMars recently penned an article titled ‘Is Vintage Too Fast?‘ While the article is framed as a question, it doesn’t take a psychic to guess at the author’s answer. Brian forcefully argues that Vintage is too fast, and that the DCI should restrict Bazaar of Baghdad and Gush to slow it down. Although Brian’s article is well written (from a rhetorical and literary perspective), and entertaining, ultimately his argument is poorly conceived, badly reasoned, and, most importantly, factually wrong. Not only is Vintage arguably slower than it has been in years, the format is more amazingly diverse, rich and deep, with more design options than ever and a rapidly evolving metagame. Far from being too fast, available tournament data suggests that this is arguably the best Vintage metagame ever. By creating a false impression of the format, Brian misleads his readers into believing that the format requires drastic, irresponsible changes to solve non-existent problems. In fact, Brian’s restriction proposals would make Vintage a significantly less diverse and dynamic format. Not only is Brian’s conclusion wrong on the facts (as I will demonstrate later in this article), his reasoning is flawed. Brian’s argument is based on three main points. Only one of these points supports his conclusion that the format is faster. The other two legs of his argument not only fail to support his argument regarding the speed of the format or his policy recommendations, but are factually wrong and misleading. The first leg of his argument is that Blightsteel Colossus has sped up the format. He’s absolutely right. Blightsteel Colossus is a blight on the format, and it is too bad that there is now a single, universal Tinker target where once there were many to choose from, each with its own merits and demerits based on an expected metagame. If there is one area of Vintage in which I’d say it is universally worse than it was in the past, it’s this one. For a format in which there is more choice than ever, this is one of the few areas in which there are truly fewer meaningful choices. Just a year ago, players who used Tinker had to choose from several Tinker ‘robots’: Inkwell Leviathan, Darksteel Colossus, Myr Battlesphere, Sundering Titan, and Sphinx of the Steel Wind, among others. Players had to carefully weigh the benefits and disadvantages of each for their particular metagame and their particular deck. Blightsteel Colossus has obsolete these options, as it is the only one-turn clock Tinker target, and that fact gives it a leg up on every other alternative, regardless of the resilience they offer. Consequently, the printing of Blightsteel Colossus has necessarily sped up the format slightly, since, before its printing, the same Tinker play would have taken at least another turn to win in most scenarios. Since Brian mentioned me by name, let me set the record straight: in explaining my disagreements with the arguments presented in his article, I explicitly noted that I agreed with him here. I clearly stated that the only point on which I agreed that Vintage is any faster than it has been in the past is the presence of Blightsteel Colossus. Even conceding this point, that does not mean that Vintage as a whole is faster than it has been in recent years (since there are many factors that determine a format’s overall speed), nor does it provide grounds for arguing for the restriction of Gush or Bazaar of Baghdad, since neither card specifically enables Blightsteel. In fact, the opposite is true! Blightsteel Colosuss makes the restriction of Bazaar less plausible, since Blightsteel cuts into Dredge’s win percentage, pre- and post-board. Blightsteel is the first Tinker target that can really race Dredge. The primary ground for Brian’s argument that Vintage is too fast is the increase in the number of free or hyper-efficient spells in Vintage. This is the issue that prompted Brian to write the article following his experience at The Mana Drain Open 15 (Waterbury), and it is also the issue that takes up the most space in his article. Josh’s Landstill deck just won its third consecutive major regional Vintage tournament (Blue Bell, a major tournament in the USA). But what’s most notable is the density of free spells. Josh’s deck has 10 free counterspells: 4 Force of Will, 2 Mental Misstep, 2 Misdirection, and 2 Mindbreak Trap. I believe that running this amount of free permission is going to be the New Normal in contemporary Vintage. There is an arms race occurring between Blue decks at the moment. The printing of Mental Misstep and Flusterstorm this year introduced two very powerful tools for combat on the stack. Blue decks with these spells are at a distinct advantage for winning counter battles over decks that rely on the traditional tools of just Mana Drain, Spell Pierce, Red Elemental Blast, and Force of Will. The printing of Snapcaster Mage only exacerbates this trend, since it is so synergistic with Flusterstorm and Mental Misstep. In fact, I believe that Mindbreak Trap is going to be a major player in the new Vintage because of the way it interacts with Flusterstorm, Snapcaster Mage, and company. However, these trends do not mean that Vintage is speeding up. There are several dynamics at work. As the Blue decks engage in this arms race, they increasingly expose themselves to Workshop decks, as neither Flusterstorm nor Mental Misstep is good against Workshops. Consequently, there is a limit to the density of free counterspells Blue decks can run unacceptably weakening the Workshop matchup. My Doomsday deck, which Brian repeatedly cites, is the epitome of this dynamic. It utilizes all of the fast Blue counterspells, but has a weak Workshop matchup. But most importantly, the arms race – increasing the quantity of free counterspells per Blue deck – doesn’t mean that the format is speeding up. Logically, if that were true, then banning Force of Will would slow down Vintage – and that’s ridiculous. The Landstill deck above is a case in point. Not all free spells are created equal. Some free spells tend to make games end faster; others tend to make games go longer. Cards like Moxen and Black Lotus – mana acceleration – are likely to make games end faster – that is, fewer turns per player per game – because they help you achieve your strategic and tactical objectives sooner. However, cards like Force of Will, Mindbreak Trap, or Mental Misstep are not, as they are as likely to slow the game down by preventing an opponent from achieving their strategic objectives (such as countering a Dark Ritual, Fastbond, or a turn one Lodestone Golem) as they are to be used to help protect your strategic objectives. If I play turn one Tinker, and counter my opponent’s Spell Pierce with Force of Will/Mental Misstep, I have just used Force of Will/Mental Misstep to speed up the game. This is the most common way that Pact of Negation is used. As if Brian had simply not read what I wrote or just ignored it, he nonetheless added this kind of example in his article, calling it the Duress principle, which is essentially the same idea I illustrated with my Force of Will example. Yes, it’s true that Force of Will and Mental Misstep can end games sooner if used proactively. But unlike Black Lotus, which is far more likely to speed up rather than slow down games, Force of Will is as likely to do the latter as the former. Otherwise, banning Force of Will would slow down the format. By arguing that free spells make Vintage too fast, Brian is conflating different categories of free spells. By suggesting that free spells can or sometimes speed up games, and using that to support his argument that Vintage is too fast, he’s misleading his readers into thinking that these free spells have, in fact, sped up Vintage, when the opposite is true. Again, see Josh Potucek’s Landstill deck. The anecdote that Brian offered in his article, Ancestral Recall protected by two Mental Missteps and a Force on turn one, is a possibility. It’s also just as likely that the presence of Mental Misstep slows down the format by countering early Ancestrals (which slows down early game development) or making it a riskier, and therefore, less frequent, play. One might say “how can that be true if lots of people are running Misstep? Won’t resolving Ancestral on turn one happen with the same frequency?” The answer is no. That’s because people are less inclined to run Ancestral or Fastbond out unprotected for fear of not just hitting a Force of Will, but Mental Misstep as well. Brian ultimately follows up his argument that Vintage is too fast by proposing the re-restriction of Gush. Gush is closer to Force of Will or Mindbreak Trap than Black Lotus. Gush is a turn three play, at the earliest, the vast majority of the time. Anyone who’s read the card Gush knows that Gush is not a turn one play, and anyone who’s read my Gush book Understanding Gush knows that Gush is a terrible turn two play unless you have Fastbond or a Lotus Cobra in play. The reason that a turn two Gush is a bad play is simple: you have two lands in play on turn two. If you play Gush now, you will have no lands in play at the beginning of your third turn. It’s much better to wait until turn three to play Gush, since you’ll gain two more mana out of the situation (3 mana total that turn) without sacrificing any card advantage. Your mana and card advantage is maximized if you wait until turn three, and this in and of itself necessarily slows down the game for the Gush player. That’s why Gush is an inherently fair card: it’s not playable (sans Fastbond) until turn three. The ordinary Gush deck’s plan is to Gush on turn three, and then Gush on turn five, because that is the sequence that maximizes your card and mana advantage. From there, the Gush pilot can hope to assemble the GushBond combo and resolve Tinker or Yawgmoth’s Will. It is for this reason that Brian’s point about the density free spells is misleading in another respect: unrestricted Gush doesn’t actually speed up Vintage. Gush decks are actually slower than many of the big Blue decks from Vintage’s storied past, especially the Thirst decks of the Thirst-Tezzeret era and the Gifts Ungiven decks from 2005-2006. I’m not even sure that Gush decks are faster than Confidant-Jace or Confidant-Tezzeret decks at accomplishing their goal. A turn one Dark Confidant generates just as much – and often more – card advantage than Gush under normal circumstances. A turn one Dark Confidant nets you one card by turn three, and two cards by turn four. Gush on turn three only nets you one card by turn three, and the same by turn four. A turn one Dark Confidant generates the same amount of card advantage as a Gush on turn three and a Gush on turn four without sacrificing any mana at all. That’s a big reason why Dark Confidant/Jace decks outperformed Gush decks in the Q2 Metagame Report, and probably continue to outperform them on a global basis. Dark Confidant generates more card advantage over time than Gush, unless you have Fastbond. The problem with Dark Confidant is that it isn’t as good on turn three or later. Gush may not be faster than Bob/Jace decks, Thirst decks, or Gifts decks, but there is a big tactical difference, however, that makes Gush decks seem faster. Because Gush is a relatively slow card, Gush decks must interact faster than Bob decks or other Jace decks in order to survive until turn three, when they can Gush for profit. Also, Gush decks tend to have a lighter mana base, and have lots of virtual card advantage as a result, so they are better able to win counter wars. Both the early tactical action and the virtual card advantage that leads to winning counterwars makes it appear as if Gush decks are fast, when they are actually relatively slow. A Gush deck may play a bunch of spells in the first two turns, but that’s only so they can survive to the point when they can profitably play Gush. Brian’s argument is that Vintage “has reached a critical mass of ‘free’ spells” being thrown around, and, as a consequence, players don’t get meaningful opportunities to interact. This is wrong because, in fact, the free spells that have entered the format increase the opportunities to interact even if mana is limited, while simultaneously slowing down the format, on average. The Gush, Mental Misstep, Mindbreak Trap metagame is a metagame that is much slower than many of its predecessors. The Landstill deck above exemplifies the new normal in Vintage. When I told Brian that I was playing a deck at the Meandeck Open on October 23rd with 4 Force of Wills, 4 Mental Missteps, 2 Mindbreak Traps, and Flusterstorms, he said “And you don’t think the format is too fast?” My answer is a clear and resounding no. In fact, these cards lead to more interaction on average, not less! It’s not that more free spells (like Mental Misstep or Mindbreak Trap) make Vintage faster. Instead, what they do is create an arms race, where if you don’t also run these spells, you are less likely to be able to compete on the stack. It is that fact which I believe Brian is ultimately objecting to – NOT the fact that Vintage has somehow sped up. And, ultimately, Brian is wrong. The Blue arms race is self-regulating. There is a limit to how far Blue decks can go, and those Blue decks that go further than anyone else – like the Doomsday deck – will be exposed to Workshops. And they may ultimately be exposed to the development of new counter-strategies which fight in different ways. Brian’s article is extremely misleading by suggesting that free spells, by themselves, make a format faster, and the examples of Mental Misstep and Gush are cases in point. Neither card actually speeds up the format any more than Force of Will or Mindbreak Trap do. In fact, they slow it down, much as they do/did in Legacy. Brian may not like the fact that Vintage control decks will now be running 8+ free counterspells – but that has long been the case in Legacy (Daze, etc. ), and even ancient Extended (Foil, etc.). My reading is that what Brian ultimately objects to is the pressure he feels to run more and more free countermagic to compete on the stack. He then feels that if he doesn’t do so, opponents will be more likely to resolve early game broken spells. While they may or may not be the case, that doesn’t mean he’s right that Vintage is faster. The spells he cites as speeding up Vintage are actually slowing it down. I’d rather have a format with Force of Will, Mental Misstep, Flusterstorm, and Mindbreak Trap than one without them. These cards mean more opportunity to interact, not less. Let’s start with Bazaar of Baghdad, since it is probably the most controversial aspect of his article. Brian’s basic argument is that Bazaar of Baghdad is too easy to find and play, and then nothing else needs happen in order to interact to win the game (ie. it is a ‘one card combo’). This is simply not true. The best proof? Watch the 2011 Vintage Champs Finals video here. Was Bazaar of Baghdad a “one card combo?” The equivalent of “moving a pawn?” Hardly. Mark Hornung got smoked in game 2, and had to fight like hell (and get lucky) to win game 3. Dredge may have a very good game 1 win percentage against the field, but that is because of the nature of how most decks are built. Blue decks are generally beat to built other Blue decks game 1 (see: Flusterstorm, Red Elemental Blast, and Mental Misstep main deck), and Workshop decks are built to beat Blue decks game 1 (see: a million Sphere of Resistance effects). These decks currently do not have main deck hate for graveyard based strategies generally, so Dredge is a natural predator for these decks game 1. But games 2 and 3 post sideboard are an entirely different story. Virtually every deck in the metagame is capable of defeating Dredge in games 2 and 3 if they are prepared, as there are a ton of different options for fighting graveyard strategies now (many of which can be cast for “free” or using colorless mana). Dredge is hardly a one-card combo deck, and is certainly not some kind of juggernaut. This is all of course moot if people designed their maindeck differently to fight other strategies besides just Blue. In fact, the arms race that is currently going on in Vintage would reach entirely new levels if Bazaar was restricted. Currently, Blue decks devote large portions of their maindecks for each other, a few cards for the Workshop matchup, with more in the board. The largest remainder of the sideboard is devoted to Dredge. If Dredge were wiped out of the field, 40% of Blue sideboards would be freed up to ratchet up the arms race against each other, making Vintage less diverse, and less interesting. The presence of Bazaar of Baghdad is a necessary constraint in Vintage and a critical part of the Rock-Paper-Scissors dynamic in Vintage. Restricting Bazaar would be Vintage less diverse and a lot more Blue. In short, Brian cites the deck I created and designed, then made Top 8 with at the Waterbury as a problem deck. Yet, what’s so amazing about my Doomsday deck is the lack of speed. Without drawing Fastbond, Lotus Petal, Black Lotus, or Mox Jet, the earliest my deck can win the game is turn three. More likely, you are going to attempt to combo out on turn four or five. If that is the ‘epitome of everything that is wrong with Vintage’ then I’d say Vintage is in a pretty healthy spot. Finally, Brian writes about the GushBond engine (Gush + Fastbond) as exemplifying the problem of speed. I find this to be a puzzling example because it is in fact so rare. In the first place, even if a player has Gush and Fastbond in their opening hand (statistically, this is likely about 4.6% or less of the time, and that’s not even taking into account they need another land in hand for Gush to be able to be cast), it’s not likely that they can just win from that position, given the restriction of Brainstorm, Merchant Scroll, and Ponder. You basically need two Gushes and Fastbond in your opening hand to have a meaningful chance of winning that turn. Each one of those turn one plays is arguably more devastating on average than any of the plays that Brian mentioned in his article, and none of those plays relies on a singular restricted card, like Gush + Fastbond does. It seems to me that Brian has selectively identified combos he doesn’t like personally, while underemphasizing far more egregious examples. Does anyone think that Fastbond + Gush is worse than Time Vault + Voltaic Key? This is the poster child for egregious Vintage combos. Instead, Brian Cited Doomsday, Bazaar of Baghdad, and GushBond. Brian’s argument that Vintage is too fast is, in my view, poorly reasoned. His premises don’t support his conclusion. His main point that cards like Mental Misstep and Gush make Vintage faster is simply not true. Free spells don’t make Vintage faster – only some types of free spells automatically do that. The free spells being thrown around Vintage right now increase the opportunity to interact and make Vintage slower, not faster. But what about the argument on its face? Brian’s argument might be poorly reasoned, but nonetheless true. IS Vintage too fast? As Brian pointed out, it has long (and I mean loooong – dating back to 1994) been a stereotype of Type 1/Vintage format that it is too fast, and that it is largely about turn one or turn two kills. No one who plays Vintage thinks those stereotypes are accurate. But how fast is Vintage? One of the great things about living in the modern information era is the abundance of available media. We need not speculate on how fast Vintage is: we have evidence. We have Top 8 videos from the Vintage Champs, the Waterbury, and even smaller, local tournaments on streaming video. From watching those videos we can observe, first hand, the true speed of the format. Far from showing a fast format, these Vintage videos often illustrate a relatively slow format, a format in which games go many turns. Not a single game in any of those videos was won or decided on turn one. In a small sample, I’ve observed that the average number of turns per player per game is about 5.5 turns. That is, each player plays about 5.5 interactive turns of Vintage per game. If my observations are accurate, that there are about 5.5 turns of Vintage per game per player on average, that’s a lot more turns than the stereotypes of the format suggest. That accounting would powerfully defy the conventional stereotypes regarding the format. And I doubt anyone could say that a format in which each player gets an average of 5.5 turns per game is “too fast.” Right? Well, it depends on how you define ‘fast’ in the context of this conversation. This would be the time that a game consumes on a clock, as measured either by total time per game, or time per player per game, as on a Chess clock. Since people usually complain about ‘not getting a turn,’ it’s natural to define speed in Magic in terms of turns rather than time. After all, I could win on turn one, but take 20 minutes to do it. On the other hand, as Brian points out, not all turns should count. It’s for that reason that I don’t count turns taken once a player has assembled Time Vault and Voltaic Key. Similarly, if a player has turn one Trinisphere, the game may progress for many more turns, but none of which the other player is able to do anything relevant to impact the game outcome. Similarly, if a player resolves turn one Necropotence, the game may proceed for two more turns, but the game was largely decided on turn one by virtue of overwhelming card advantage. It’s for that reason that I think we can distinguish between turns taken after a game was decided or almost certainly decided, and turns taken in which the game was in doubt. I call this metric for the latter ‘meaningful turns.’ This requires a bit of judgment, but no more than is usually applied to Chess games, where it is widely agreed that certain board positions are won or lost. The key point, from Brian’s perspective, is that turns alone can’t be the sole metric by which we evaluate speed because some turns are taken in which the game’s outcome has already been decided. I agree, although they are still a better measure than nothing. If we look at meaningful turns instead, then we can get a better gauge of the format’s true speed. In my sample, I already discounted turns taken after Time Vault + Key were assembled. However, looking at that sample, and eliminating turns taken under conditions in which a game was already decided shaved just a few turns from the overall sample, making the average turn per player per game just a few tenths of a turn faster, but still well more than 5 turns per player per game on average. I hope that other players undertake this exercise and analyze their own games, so that we may get an even better idea of how fast Vintage really is, rather than simply rely on speculative assertions. But even if my accounting is correct, that alone doesn’t answer the question of whether Vintage is too fast. ‘Too Fast’ Relative to What? “Slow” and “fast” are relative terms. 25 miles per hour may be slow for a car, average for a train, and really fast for a bicycle. If Vintage is too fast, it must be too fast relative to something. What is that something? Should we measure the speed of Vintage by Standard? Modern? Extended? Legacy? Vintage is an inherently faster format because of the availability of Alpha’s mana acceleration, which exist in no other format. This gives Vintage a faster turn clock than probably any other format. That doesn’t mean Vintage’s clock time is faster than other formats. In fact, I would argue that it’s slower than other formats as measured by the fact that “extra turns” (meaning the 5 additional turns at the end of a tournament round) seem to take longer in Vintage than any other format. Vintage isn’t a faster format in terms of clock speed – it just compresses more action and the same amount of decisions as other formats into fewer turns. To answer the question of whether Vintage is too fast, we must compare Vintage not to other formats, but to different iterations of itself. In Brian’s article he wrote “In order for me to say that Vintage was ‘too fast,’ it would have to mean that it took significantly fewer turns to play games in Vintage, from then [until] now.” He’s arguing that certain developments and changes to the Vintage card pool have made Vintage faster. The question, refocused, simply becomes: Is Vintage faster now than it has been in recent years? The answer, to me, is clearly no. I strongly believe that the Average Number of Meaningful Turns Per Player Per Game has not sped up more than a small fraction of a turn in recent months, and is significantly slower than it has been in recent years. In addition, the number of meaningful turns players get to take is more than sufficient for players to interact and make meaningful in game decisions. In short, Vintage is as interactive, similar in number of meaningful turns per game, and as skill-intensive as its been in years. I’ve played in 5 tournaments in the last three months, and reached the Top 8 of each of them. If Vintage wasn’t skill intensive – or was merely a coin flip – things like that wouldn’t happen. I do not doubt that Vintage is fast relative to other formats, but these other formats do not contain cards like Mishra’s Workshop, Black Lotus, Tinker, Oath of Druids, Yawgmoth’s Will, and many other powerful cards. Even if they understand that the average number of turns per player is high, I do not doubt that some Magic players would find turn one Forbidden Orchard plus a Mox into Oath of Druids unacceptably fast. 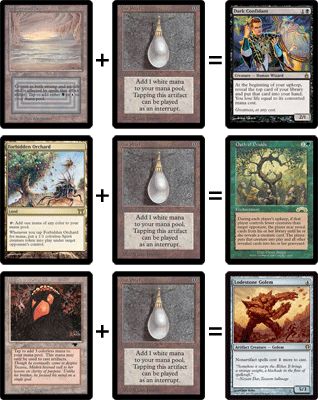 Just as many Vintage players find Workshop plus a Mox into Lodestone Golem unacceptably fast. It’s my view that Brian has selectively highlighted areas of Vintage that he dislikes (specifically the kinds of games generated by Gush and Dredge decks) while downplaying or ignoring other, even more salient, ways in which Vintage is fast. After the restriction of Thirst, Dark Confidant decks won two consecutive Vintage Championships. A turn one Dark Confidant will create overwhelming card advantage within just a few turns. It’s little wonder that at least through the second quarter of 2011, Confidant/Jace decks significantly outperformed all manner of Gush decks. The truth of the matter is that Vintage right now offers ample opportunity to meaningfully interact, but just as in every other format, it is incumbent upon players to pack the right answers when building their decks. Far from being in some sort of dark age, Vintage right now is an exciting format with many possibilities and a diverse array of options. Brian repeatedly cites his Waterbury experience as a negative one, and formative in terms of the development of the ideas for his article. Yet, I think the Waterbury results exemplify just why Vintage is so amazing right now. Take a moment to hop over and review the Top 8 decklists . By almost any perspective, this is about as healthy as Vintage can get. Just look at the spread of strategies! You have decks trying to achieve totally different goals. But it’s not just the strategic or archetype diversity, it’s also the diversity of pillars and tactics. You have Drains, Workshops, Gush, Bazaars, and even Dark Rituals represented! Perhaps the best part is that the two non-Blue decks were the finalists! Within the Blue decks, you have Oath, Dark Confidant, Snapcaster Mage, Gush, Jace, the Mind Sculptor, Fact or Fiction, Tezzeret the Seeker, and even Nights Whisper represented as sources of card advantage! The tactical diversity is even more impressive. You have Flusterstorm, Mental Misstep, Thoughtseize, Duress, Spell Pierce, Mana Drain, Red Elemental Blast, etc., all vying for spots, which underscores the options and current health of the format. In 2007, I offhandedly used the term “Golden Age” to describe the period in which Gush was unrestricted and Future Sight had introduced a ton of Vintage playables into the format. That “Age” came to a crashing halt a year later when 5 cards were swept out of the format and onto the Restricted List. From that point forward, there was a very unique three month window in which Gush, Flash, Merchant Scroll, Brainstorm and Ponder were restricted up until Time Vault was finally re-errated and Alara block arrived, bringing Tezzeret with it. The simultaneous printing of Tezzeret and re-errata of Time Vault brought what was, in my view, a dark period, perhaps the darkest, in modern Vintage history. The 2nd Gush/Flash era may not have been the most fun for the broadest number of players, but Gush decks never reached the level of dominance that Mana Drain/Thirst For Knowledge fueled Tezzeret decks achieved from October 2008 until Thirst was mercifully restricted in June 2009. From that point on, Dark Confidant became the Blue draw engine of choice, and for two consecutive years, Bob based Time Vault decks won the Vintage championship. The printing of Jace and Lodestone Golem in early 2009 improved the performance of Workshops and gave blue decks yet another 4cc draw engine to pair with Bob, but little had fundamentally changed since the restriction of Thirst except for the strength of Workshop decks in the field. Bob decks were replaced by Bob/Jace decks. Dredge decks continued as they were, and pretty much had been, since the printing of Dread Return and the emergence of manaless Dredge shells in January 2008. Then, the DCI boldly unrestricted Gush, on the theory that without Brainstorm and Scroll, Gush would be not be nearly as powerful, and not even necessarily a superior draw engine to Dark Confidant. For a long while, this proved to be true. It wasn’t until August 2011 that Gush decks truly emerged as a top tier competitor in the new metagame. However, this also happened while Fact or Fiction was being unrestricted, and Snapcaster Mage was being printed, opening up more strategic and tactical avenues. The result? Never before in the history of Vintage has there been so many unrestricted Blue draw engines available to a pilot: Dark Confidant, Gush, Snapcaster Mage, Jace, Fact or Fiction, Tezzeret, Mystic Remora, and more rarely used ones such as Night’s Whisper, Thoughtcast, and Intution + Accumulated Knowledge. In fact, this is the first time ever that Gush and Fact have been unrestricted at the same time. But it’s not just the diversity of draw engines, it’s the diversity of strategies and approaches. There are more options than ever before to the Vintage player. As a control player, you have far more choices than simply Mana Drain and Force of Will. You get to choose among 6-7 different viable counterspells, and configure them in a myriad of ways. As a Workshop player, you can play super aggressive Slash Panther, combo-Kuldotha, or control with Smokestack or Null Rod. I have never seen a Vintage format brimming with so many possibilities and no clearly superior choice, as was almost always the case in the past. This is a true Golden Era, and quite possibly the single greatest iteration of Vintage I have ever seen. Sure, there are dark spots, like Blightsteel Colossus, but those are greatly outweighed by the sheer diversity of options and possibilities currently at the fingertips of the Vintage player. Has there ever been a time when you can pick and choose among so many different options? Not that I can remember. In my opinion, restricting something now, at this incredible moment of strategic diversity, would be a tremendous mistake. Gush only had one player in the Waterbury Top 8, which is hardly any sign of dominance. But restricting Bazaar would badly neuter an important pillar to the Vintage metagame for little reason, and make the blue arms race even worse. Although I wished that I had won the Vintage Championship this year, I think it’s a good thing that Bazaars finally won. For 6 of the previous 8 years, Mana Drain decks had won the Vintage Championship, and 7 of the 8, big Blue decks. Dredge winning is not just a victory for Dredge, it’s a victory for the format. It’s a symbol of the diversity within the format, and the viability of non-Blue options. Dredge is entirely self-regulating. I am the only person who Top 8ed both the Vintage Championship and the Waterbury this year. Had I faced the Dredge player in either Top 8, I likely would have won the match, especially at the Waterbury. My Doomsday deck is a nightmare matchup for Dredge, since I not only pack plenty of Dredge hate, but have Mental Missteps to protect it and can win on turn three. In both Top 8s, Dredge was paired up against players who had inadequate sideboard hate, or simply played poorly (like Rich Meyst keeping a hand with no answers and no plan in game 3). In the Vintage Champs and Waterbury Top 8s, there was only one Dredge decks, and across the ocean at the Eternal Weekend 2011 in Spain, there was one Dredge deck in the Top 8, while the Bazaar of Moxen 2011 in France (the biggest Vintage tournament of the year anywhere) had two Dredge decks in the Top 8. Dredge is not oppressing local tournament results either, constituting well under 15% of total Top 8s, showing that it is far from a dominant strategy. I would strongly oppose the DCI restricting Bazaar or any other piece of Dredge, as it is not dominant, and it is actually healthy for Vintage to have competitive graveyard-based strategies. Before Brian’s article was published, I was curious whether the Vintage community agreed with his views of Dredge. So I posted a poll asking Vintage players whether they believed Bazaar of Baghdad should be restricted or not, and included an ‘undecided’ option. Over 100 individuals voted, and the results couldn’t have been clearer. Exactly 80% of voters oppose the restriction of Bazaar of Baghdad. The Vintage community is strongly opposed to the restriction of Bazaar. However, if the DCI feels that the Dredge strategy is too ‘unfun,’ then there are a lot better targets than Bazaar, such as Bridge From Below or Golgari Grave-Troll to slow down Dredge a bit, rather than killing it (along with other decks like Bazaar Madness, and Worldgorger Dragon combo). Ultimately, the idea that anything needs to be restricted in contemporary Vintage seems ridiculous to me at the moment. I’ve never seen a healthier metagame. It’s too bad that Vintage is so expensive to play because it’s incredibly exciting. In this section, I’m going to cite a number of sentences where Brian makes false or misleading statements. False. Mental Misstep is a tremendous weapon against Dredge. It stops virtually every answer they have to your graveyard hate at no mana, and is an amazing anti-Dredge tactic. True, but misleading. A Mental Misstep war on turn one over a Duress or a Preordain may become commonplace, but it’s not a problem, and is certainly not a warping factor (ie a “sheriff” regulating something). No game is likely completely decided on that basis. The main thing that Brian cites is Ancestral Recall counter-wars, where the Mental Missteps protect Ancestral. That’s the exception to the rule. Early Ancestral should be a much more guarded play as a result of Mental Missteps, and there are other ways to attack this problem, such as running Misdirections and Mindbreak Traps. False. The DCI has done a fantastic job managing Vintage in the last few years. Brian wanted the DCI to restrict Jace, the Mind Sculptor a few months ago, and he would have restricted Lion’s Eye Diamond and Dark Ritual in Legacy. I agree with Brian that Brainstorm is probably the real culprit in Legacy, not Mental Misstep, but that doesn’t mean that the DCI has done a bad job: they had a choice, and chose one over the other. False. I know that’s Brian’s opinion, but as a factual matter have there ever been more options in Vintage? False. I enjoy playing against Dredge in tournament. I find every post-board game to be interesting, interactive, and fun. The jockeying for position, back and forth, many turn chess match is very fun and intense. False. Because they aren’t unbeatable. Not a single combo that Brian has mentioned is unbeatable. Every single one is easily answered. False. The Vintage Champs had nearly 150 players, which is the largest turnout in 6 years. It was a 25% increase in attendance from 2010, suggesting that the format is much better and more fun than it was last year, if attendance is a measure of interest. It’s true that the Waterbury had a dip in attendance, but not by the margin Brian cited (the previous Waterbury in 2010 had 125 players, but the 2009 tournament had only 113 players). Meanwhile, the Bazaar of Moxen in France drew 383 people for the Vintage segment, up from 347 players the year before. That’s hardly definitive proof that people dislike the format, and I would suggest that the format is so diverse and evolving so quickly that some players feel uncomfortable competing, but not because of the inherent lack of quality in game play.